As widely expected, the Bank of Canada lowered its benchmark overnight lending rate by a half of a percentage point to one per cent at its setting on January 20th, 2009. The trend-setting Bank rate, which is set 0.25 percentage points above the overnight lending rate, declined to 1.25 per cent. The Bank acknowledged the global economy has deteriorated further since it last lowered rates in December 2008, when it announced Canada had entered a recession. “Major advanced economies, including Canada's, are now in recession and emerging-market economies are increasingly affected,” said the Bank when it again lowered interest rates on January 20th. The Bank has repeatedly lowered its policy interest rate to support economic growth. Since December 2007, the Bank has cut its overnight lending rate by a total of 3.5 per cent. The Bank downwardly revised its forecast for economic growth in 2009, but revised it upward for 2010. It also pushed the goalposts out to the middle of 2011 as to when it expects inflation to climb back to the two per cent midpoint of its target range between one and three per cent. The Bank targets the core rate of inflation at two per cent. The rate has stayed below the target level since October 2007. “The Bank’s revised forecast for economic growth and inflation means it won’t raise interest rates anytime this year, but credit conditions have tightened, which will mute the benefit of the Bank of Canada’s recent interest rate cuts for consumers, business, and the economy,” said Klump. When the Bank cut interest rates on January 20th, the advertised five-year conventional mortgage rate stood at 6.75 per cent. 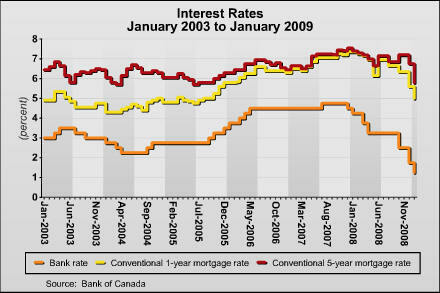 This is down 0.74 per cent from one year earlier, and 0.2 per cent below where it stood when the Bank made its previous interest rate announcement on December 9th, 2008. The ongoing credit crunch has led mortgage lenders to reduce discounts on advertised mortgage interest rates, and in some cases these have been completely eliminated.